If you haven’t heard it before – and if you’re espying this post in Sydney or Sofia you probably haven’t – you’re hearing it here: ride the London underground 15 minutes longer than the ride is supposed to take and you get your money back. In fact, I’d allow that a sizeable crew of Londoners haven’t heard that before either, but it’s true, and if you doubt me look here. Indeed – your intrepid correspondent has collected twice, a pair of lucrative postscripts to some down time I experienced down under. It’s all true; but how do the powers that be know you’re on the up-and-up when you press your cash-back claim? They know because they’re watching your Oyster card, your ticket through the transit system that means to record your every point of departure and disembarkation, and whether you really were stuck on that Northern Line idling at Tooting Bec on the 17th at 2:12 pm (yes, editor, there is such a stop). The dates in the Key Trends sheet kick off in cell A2 from the second reporting period of the 2011-12 financial year, and don’t be flummoxed by the 02 at the head of the cell. That isn’t February, but rather the second of the fiscal year’s 13 28-day reporting intervals, a curious baker’s dozen that I suspect has something to do with 364’s divisibility by 13, and the cooperative absence of any underground service at all on December 25. But the apportionments aren’t quite that neat. In fact the day total for 2012-13 comes to 365 (note the 29 in cell C26, probably a leap-year emendation), while C27 registers a 27-day interval, and C39 and C52 have inherited 30-days stretches. Apart from bidding us to think about how extended textual reflections might fitly reconcile themselves to the data to which they’re annexed, clarity calls for a most simple remedial step – just click the Show All Comments button in the Comments button group (Review tab), and make the comments disappear. To recall any comment in particular, click on its cell and try Show/Hide Comment, in the singular. Why the sheet insisted on its in-your-face comment revelation is a matter to put before Transport for London. Copy down K and observe the notable flux among the percentages, particularly the spikes in C38 and C41. Those quantum leaps owe their king-sizes to job actions, and here you would profit from consulting the attached explanatory comments. How you’d choose to evaluate these lateness proportions, which tend to oscillate across the 20-30% band (though the variation is real – observe the 14.88% for the period ending October 13 2012 in row 20), is perhaps a matter for the glass half empty/full disputants. A rough-hewn null hypothesis might predict that as many rides would pull into their rider-intended stops late as early, by some margin. A minute-late ride is late, after all, and so a 25% aggregate lateness measure might not fairly serve as a full-on indictment of the underground service. Still, late is late, once the baseline, expected lengths of journeys are decided. But another simple but trenchant measure of punctuality offers itself from the data. We could divide the number of customer hours lost by Operated Kilometres (as Transport for London would spell it)counted in the G column; that is, the accumulated distance travelled by all trains in the period. 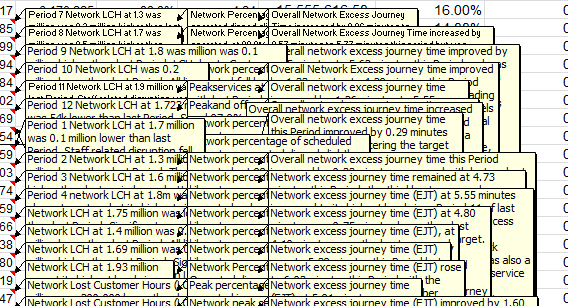 It stands to reason that all things being equal greater distances traveled associate with more lost hours, and because we have all the data we need here – unlike the Pct Late metric that works with the same daily passenger average throughout – this little fraction may be all the more incisive. We could title the L column something like Ratio of Hrs Lost to KM, simply divide the value in F by the one in G, and copy down. You’ll also note the matrix of lost customer hours in its eponymous tab, an enhanced compilation of data pushing further back in time to the 2003-4 financial year and treated to an off-the-shelf conditional format. Just one question here: the matrix provides lost customer hours for the first reporting period of 2011-12 – even as the listings for that year in the Key Trends sheet only start at period 2. Is that what they mean by lost customer hours?